There are times when I like to have a book take me to the south, as I don't spend much time there to begin with. I find it fascinating to get caught up in the imagery of the stories that are spun by authors who know the south like the back of their hands. And Beth Hoffman definitely fits into this category. With "Saving CeeCee Honeycutt," she takes her readers on a trip to 1960's Savannah, Georgia and introduces us to a bunch of eccentric and fascinating women. Twelve year-old Cecelia Rose Honeycutt has the unfortunate task of looking after her mother, who still thinks she's the 1951 Vidalia Onion Queen. With her outrageous temper and outlandish dress habits, her mom manages to ruin her own reputation in their Ohio suburb and take Cecelia down with her. Then a tragedy strikes and Cecelia is whisked off to Savannah to live with her great aunt. There she meets a bunch of different women who offer her advice on how to live her life and she also learns about the power of female friendships. 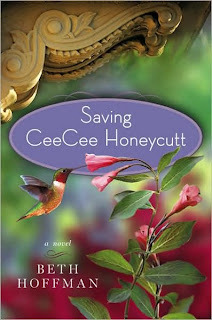 With "Saving CeeCee Honeycutt," Ms. Hoffman drew me into the story right away with her captivating prose, strong visualizations and interesting characters. Cecelia is a very sympathetic narrator who is both strong and vulnerable at the same time. Each character who came into her life had their own style and was memorable, as a result. The dialogue was honest and refreshing, as well as easy to follow along. There were morals and sage words of advice dished up in a way that wasn't preachy and left me longing for more southern women wisdom. There were also a lot of funny parts that made me laugh out loud. I could definitely see this story being made into a movie someday. Overall, "Saving CeeCee Honeycutt" reminded me of some Fannie Flagg novels I have read. This is a good thing, as I am a fan of Ms. Flagg's work, as well. However, it was also original and will stick out for me for years to come. It had a lighthearted flair, but was also meaningful. It made me think about and treasure all the female relationships in my life from the ones with my grandmothers to the ones with my newfound friends. I recommend this for anyone who wants a "feel good" story any time of the year. Thanks to Shannon Twomey from Viking, Penguin Books for the review copy and for offering five copies to some lucky readers in the US and Canada. 1. Please tell us: What is a funny memory you have with your best friend? 2. Please tell us: How does the city/state/region/province where you live have an impact on your personality or the way you live your life? US/Canada only. Giveaway ends Sunday, December 5th at midnight EST. Arizona impacts my life: I'm always on the look-out for snakes, tarantulas, and scorpions! No need to enter me -- just wanted to say I loved this one, too! Enjoyed your review and reliving Beth's enchanting novel, which definitely brought me right into the steamy South! No need to enter me as I already own this one, I just wanted to let you know that this is posted on my sidebar! Funny memory would be laughing so hard we spit food out of our mouths onto each other. A funny memory with my best friend is when we did at home spa mud masks:) It was a great time and made for some great pictures! Living where I do has impacted my hobbies. We have wonderful summer weather that makes camping awesome and lots of snow to sled in. Funny memory with a best friend: I was out at the lake with some girlfriends and was excited to show the cute bikini top I had purchased. This was the second bikini I had ever owned, much less brave enough to wear. My friend Pam came strolling out into the yard, caught my eye and came up to me with gentle smile, rested her hands on my shoulders and murmured, "You know you have that on upside down, right?" Wisconsin impacts my life: I've lived abroad for two years and have traveled around the US and the impact of growing up in the Midwest is the friendly, open warmth you aquire like a second nature. Strangers chat in grocery store lines and people will wait with a child's teammate whose parents are running late to pick them up so they're not alone. I've known my best friend since I was 2 years old...the funniest memories are looking back at the old movies filmed by my grandfather. I think living in British Columbia on the West Coast in Canada makes me an open, free-thinking, multi-cultural, health centered person. Funny friend memory - laughing at a grown-up ice skating at an indoor rink & he came over to confront us & I faked a French accent & he mumbled "Sorry" and skated away! My home is in Alabama and I love everything about it. It's great to be southern & we're more diverse that many people assume. I follow this blog & joined on facebook. My funny friend memories often involve baking. Colorado has made me much more casual. I have wanted this book for a while now! I have heard so many great reviews of it and have it on my wishlist :). Well, my best friend happens to also be my cousin, so we have known each other since I was born and she was a year old. We have had lots of opportunity for funny memories :). The one that sticks out the most is when we were both around 10 and she kept stating she got to be all the pretty characters in The Last Unicorn movie we were watching before I had a chance to speak. I got so flustered I screamed out that I was the next character I saw...which was an angry, big bull! She still teases me about that to this day! I just wanted to jump in and say a special "Thank you" for your lovely review of my novel. I'm delighted that you enjoyed CeeCee's story and appreciate your kind words! Funny memory - we used to take my boombox down to my cul de sac and play the radio and put on concerts for the neighbors!! NoVA - my life is a little more tense due to the traffic and the lifestyle up here! I am a GFC and joined the facebook network! When I lived in CO, I was outdoors a lot (hiking, snowboarding, rock climbing) since they're is always something to do in the summer or winter...so you could say it made me more adventurous! 1. Funny memory with best friend: Well, first we'd have to narrow down which "best" friend because I have a few & can't pick just one. Then we'd have to focus on a particular decade because I've been friends with most of them for more than 30 (in some cases 40) years. That's a lot of laughs. 2. Well, I live in Calif. & we are definitely a blue state. For the first time, all the people I voted for won! Yay! My particular town has been traditionally conservative &, when I was growing up, bigoted and discriminatory. It has evolved in many, many respects, but I still have a love/hate relationship with it in some ways. But I am a civil rights attorney & very much dedicated to equality, nondiscrimination, and not judging others' choices. So I'm probably in the right state and even the right region (north-central Calif., 90 min. from SF, 35 mi. south of Sacto). I have no plans to go anywhere. Funny memory with best friend: Making mudcakes (yes, they are made from real mud!) with Alice. Well, living in Texas now means that we spend all summer indoors, but now that it is cooler we can finally be outside when everyone else is bundled up inside! My funny memory is my best friend and I would stand in front of the white pillars on each side of my front porch and pretend we were statues and not move. I lived on a busy road, and when we were young(yes, we were young!) we really thought people thought we were real statues.....we still laugh about it! Living in the Northeast has impacted my life as winters are cold so we stay inside or try to get away from the cold weather, and from spring through fall we have a camper we have seasonal right now in the mountains which gets us out of the city/suburban life. I grew up in the north east, settled in the midwest but have lived in the South also and must say I am NOT a southerner! LOL It's amazing the differences found by merely crossing the state line! Funny memory... A friend and I went to a haunted house with my Mom. Girlfriend was SO scared she was wouldn't move when she came to a doorway to cross through. Mom and I would collectively push her and hang on as we ran screaming through yet another terrifying scene. In one room Girlfriend was so distraught she grabbed the person in front of her around the waist, thinking it was me, while at the same time the person tried to get away. A little push, a little pull and the poor woman ended up with her pants around her ankles while she and Girlfriend screamed until someone from the house staff helped them. My Mom and I were too busy laughing and trying not to pee our pants during the rest of the tour! Hahaha - I have some great and funny memories with my best friend growing up in a small town!! Not much to do there...hahaha We stayed up late, we drove around...a lot, and we tried to stay out of trouble!! Would love a copy of this one. Even though I live in the South, I still love reading stories set there. My best friend is a "glass half full" kind of gal. One day after she cheered me up, I called her "Princess Silver Lining" and it stuck. I still call her PSL sometimes, especially when she's being that special brand of annoyingly perky! I live near a small city (Chattanooga), and I love being able to enjoy a quiet life at home, but still be close enough to always have plenty of choices when I want something fun to do! NYC makes everything move at a faster speed than the rest of the country, and you always have to be extremely professional! One funny memory is my friends and I jumped into the car following an O-town (the original Making the band group) and followed their tour bus for miles! The next year we went to the concert again and wound up doing the samething. I know it doesn't sound funny but we had a ball doing it! Sounds like a good book. Count me in!